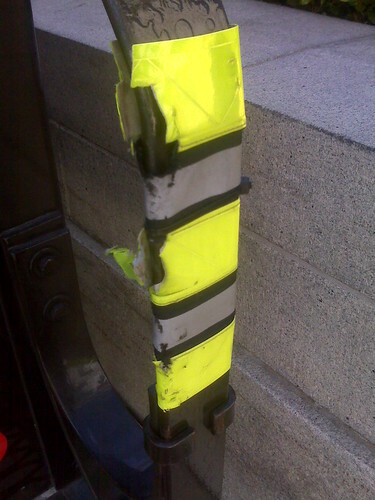 I wrote about the reflectors on UPS trucks in an earlier post. Like Hot Chip says, nothing's new forever. 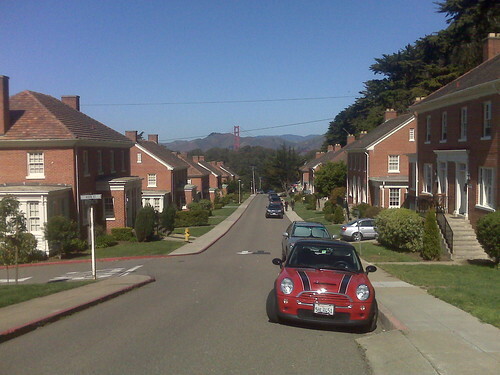 I had a drop on Liggett Ave. in the Presidio. There was a birthday party for a little girl set up down the street. There was bouncy castle and two set tables with mini Swedish flags in the centerpiece decorations which reminded me of the time I wandered around the suburbs of Basil, Switzerland high. Weird neighborhood unlike most others in SF. Also reminds me of the one in A Wrinkle in Time where everybody's jumping rope in unison and all that. Nice pic of a really odd part of town. love your pov photos. i'm looking forward to more.